I arrived in Evanston, Kellogg's home, on Sunday night. Thus far, my entire attention has been on getting myself set up on in the US. In some ways, it has been easier than I expected. Some frustrations remain, nevertheless. 60201 – Evanston – is a quaint little university town. Thankfully, this means some of the numerous amenities around the town know exactly what my requirements as an international student are. The bank made it almost effortless to get an account, even sorting out proof of residence for me through their knowledge of the university intranet and contacts at the university. The cell phone shop automatically game me my student discount for my monthly phone bill – without asking for any form of student ID. While I stood at the front of my apartment, waiting to direct them, the removal people already knew how to find my apartment block’s rear loading entrance and had started moving furniture in. However, what frustrates me is that there seems to be few grocery stores in my part of Evanston that provide genuinely student prices. Living in Park Evanston, Whole Foods is next door and extremely convenient. However, the cheapest priced bread (for example) is $4. This is still over twice the cost of what even the premier groceries in London would charge. 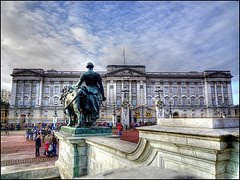 In fact, that kind of price could only be found in London if you lived next door to the Queen. The Northwestern campus is nice, but it’s not Buckingham Palace. To save on the weekly trip to Jewel-Osco, I’m thinking of using an online grocery service. This would also help me plan my meals upfront – a sure way to control those notorious US calories. You're right, Whole Foods is not friendly to the student budget. I live within walking distance of Whole Foods flagship store and corp offices, but I can't afford to shop there! I have heard people argue that if you stick to the Whole Foods store brand ("365"), it costs the same or less than shopping at other grocery stores. But I don't believe it for a minute. Of course, it doesn't help that every time I step foot in a Whole Foods, I end up leaving carrying something hideously expensive like a good bottle of aged balsamic vinegar or bulk quantities of organic dark chocolate. Dangerous place, that Whole Foods. Sounds like Whole Foods stirs up quite a bit of emotion. I certainly feel like a Whole Fool going in there. Please feel free to take a look and let us know how you feel so that we can improve our services. If you like our idea, please also tell your friends who are still in MBA program. I believe this would be a great help to them! Thank you so much!